The Carpet Injector. Why Inject? Urine penetrates deeply into absorbent materials. As it dries, the water evaporates leaving behind an aggregate of organic and other components that soon crystallize, forming a multitude of "salts." In effect, the dried salts form a barrier to any liquid you may later try to introduce. Unless you are able to gain access to contaminated fabrics from both sides, the most effective way to treat dried urine is by injecting a high-quality bacterial/enzyme digester directly into the contaminants. Remember, you are fighting gravity as the urine crystals are pulled deeper and deeper into the carpet and pad. The salt "plug" resists penetration from the top and most of your AIP will tend to seek the course of least resistance, soaking into areas previously devoid of urine. Unless there is adequate penetration into the plug, the effectiveness of your treatment will be diminished. Flooding as a treatment wastes costly AIP product unnecessarily, and spreads a dilution of urine into an ever wider area, contaminating that as well. In carpeting, the bulk of urine is normally underneath and permanent staining is more likely to occur when over-wetting the area. More of the urochrome, a natural dye found in urine, can flush to the surface and deposit on your carpet's face yarns. You must use great care when handling a sharp needle! You can easily puncture yourself. 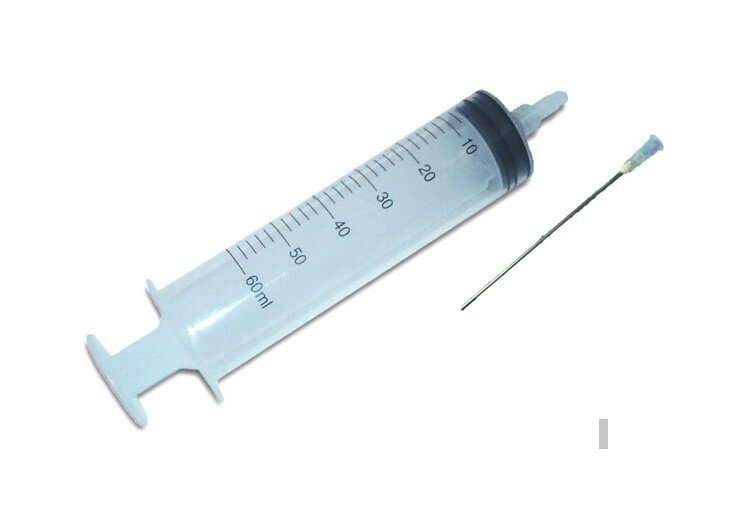 These needles are normally packed in sterile condition. Of course, once used in stale urine decay, a severe infection could result. In the event you do jab yourself it is recommended you visit a doctor immediately and receive a tetanus shot! Disassemble when not in use. Store AWAY from children at all times. The salt "plug" resists penetration from the top and most of your bio-chemical will tend to seek the course of least resistance, soaking into areas previously devoid of urine. Unless there is adequate penetration into the plug, the effectiveness of your treatment will be diminished. To treat by flooding wastes costly biological products unnecessarily, and spreads a dilution of urine into an ever wider area, contaminating that as well. In carpeting, the bulk of urine is normally underneath and permanent staining is more likely to occur when over-wetting the area. More of the urochrome, a natural dye found in urine, can flush to the surface and deposit on your face yarns. Caution:You must use great care when handling a sharp needle! You can easily puncture your flesh! These needles are normally packed in sterile condition-of course, once used in stale urine decay, a severe infection could result. In the event you do jab yourself it is recommended you visit a doctor immediately and receive a tetanus shot! Disassemble when not in use. Store away from children. For carpeting that is saturated with urine, this is the product you should get. It gets Anti-Icky-Poo under the pad where a lot of smells come from. Ordered 2 injectors for my carpet and each injector came with 2 needles. Great product to get anti-icky poo into the carpet padding and floor underneath. If you have carpeting, injecting makes a huge difference vs just spraying the product on the surface of the carpet.